Such places are reserved for only the greatest players to grace the English game, and no doubt Kane will be absolutely delighted to find his name alongside such iconic Premier League players- especially at such a young age. This is just the latest achievement for a player that continues to defy the odds, firmly shutting the mouths of those that called him “a one-season wonder” when he first burst onto the scene in 2014. Okay, so his debut was the season before that, but 2014-15 was when Harry Kane really set himself on a path that would see him become Tottenham’s all-time Premier League top-scorer. Keep It Kane: the new ‘Bend It Like Beckham’? When you consider the amount of money being splashed around amongst the fabled ‘Big Six’ in recent years, few would have predicted that the best striker in the country would come through the Spurs youth system. While Manchester United, Chelsea and Arsenal have spent huge money on boosting their attacks, the young lad from east London remains completely untouched as the top marksman in Europe. It’s a remarkable story- and one that’s certainly worth commemorating. Considering that every single one of his goals has come in a pair of Nike Hypervenom’s, it seems only right that Nike should be the ones to pay homage to this achievement. The new Nike Hypervenom 3 HK are a pair of absolutely stunning football boots, built specially to salute the Tottenham talisman and his entry into the prestigious ‘100 Club.’ After breaking record after record, it’s fair to say that special-edition Kane boots have been a long time coming, and Nike’s creation certainly doesn’t disappoint. It’s hard not to see the Spurs influence in the beautiful design, with a two-tone white and blue colourway matching up perfectly with this year’s home kit. With the famous Swoosh and ‘100’ graphics standing out prominently in gold, Nike have wasted no time in highlighting the magnitude of Kane’s achievement. 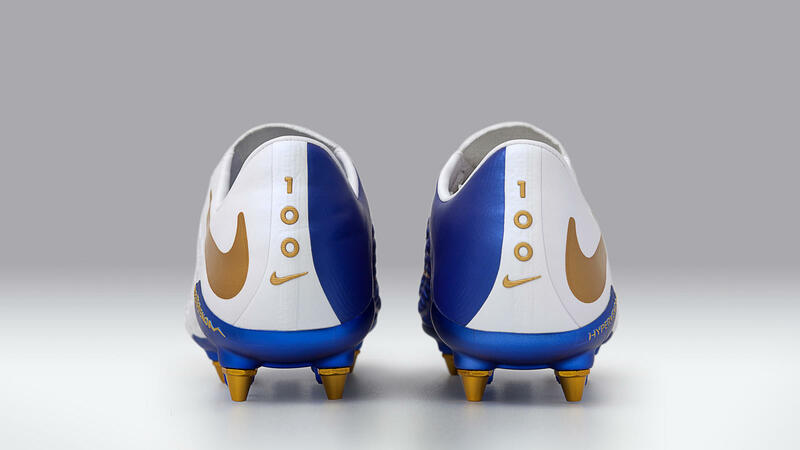 ‘100’: embossed in gold, the colour of winners. The words ‘Keep It Kane’ are printed in the sockliner, while ‘Kane’ is stitched in gold towards the top of the laces. 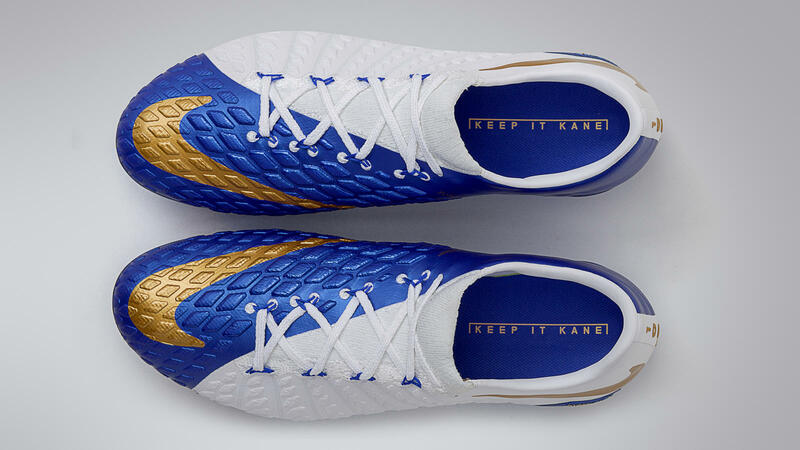 It’s the subtle golden details that really make this design so special, creating an incredibly classy, polished football boot that acts as a fitting tribute to the best striker in the world right now. We all know that the Hypervenom is the perfect boot for deadly finishers, and it’s this ruthless streak that’s led to Harry Kane becoming one of the biggest names in football. In short, the Spurs man just can’t stop scoring, and these boots do all they can to help continue his unbelievable form. Kane is due to show off the new boots during his next game, so we’re expecting to see them in action either on Wednesday, when Spurs take on Newport County in the FA Cup; or on Saturday, when Kane will be hoping to continue his goal-scoring form in the North London derby. Not a bad game for these football boots to make their debut at all.